A Shawn Nelson entrepreneur & motivational speaking event; Long Beach Convention Center, October 2014. Congrats to Jason Knight of Fredericksburg, VA, for winning a brand new Lovesac Supersac upon joining the Lifeonacouch.org email list! I got to spend this past weekend in Orange County, California—one of my favorite places on the planet (having lived in Huntington Beach, opening up Lovesac stores circa 2002). I’m flattered to have been invited there to deliver a speech to the NGLV (Next Generation Laser Focused Visionaries) a group of young entrepreneurs, some of who are already making six-figure incomes while still in their teens! 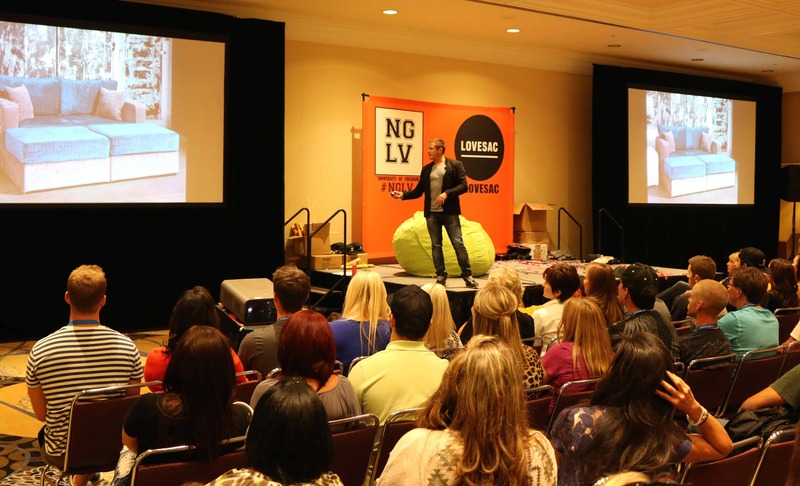 Speaking in Long Beach at the NGLV gathering. I call this speech, “Get Off the Couch.” This is because I believe that the big divide—the major difference between entrepreneurs and people who wish they had their own business is that entrepreneurs actually get off the couch, usually right then, and go make something happen. Entrepreneurs do this over and over again in business and in life. They’re always (actually) doing something—not just talking about it. I typically incorporate a whole slew of “Shawnisms” into the telling of “my Lovesac story” with the purpose of making the entrepreneurial journey real and actionable for everybody. I think that the Lovesac story really resonates with just about anyone because it is so simple. I am not a computer programmer or even industrial engineer. I just thought it would be funny to make a really big beanbag, and I did it. Anyone can do that. I know that this advice perhaps seems vague and not specific enough. But every business, every industry, every person, every idea and every situation is so different that the actual strategies and tactics that worked for me are very unlikely to work for you. 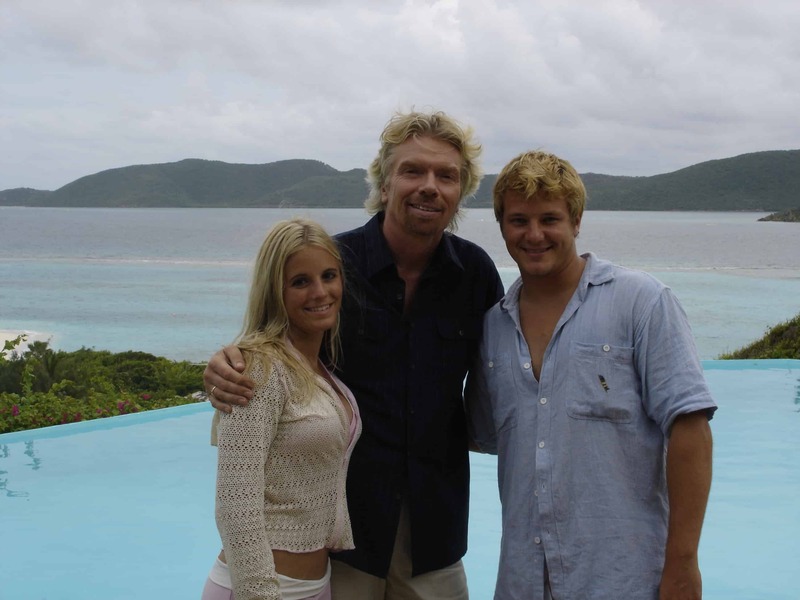 Tiffany and I with Branson on Necker Island. But, there has been so much written on the subject (hence my “Read, read, read” advice from last week) and there are so many accomplished people in this world who have done “it” before, that I truly believe: if entrepreneurs would just do these two things, religiously, they will most likely find success—or at least avoid so many mistakes and so much heartache. As for networking, a good friend of mine wrote the book on that one. Check out “Up Your Game,” by David Bradford. But put simply, I recommend that you find someone smart, everyday, to take to lunch and learn from. Through this process you will find yourself a mentor or two…and mentors will change your life. To be totally honest, I have always been very bad at the networking part of things. I am classically too self-reliant. I am too headstrong. Some might call me cocky. Because of this I have a hard time asking for help. I recognize this, and at this point I almost force myself to reach out, ask for lunches and seek out people who are smart and successful. Richard Branson and my ridiculous hair. One of the most influential mentors in my own life, of course, is Richard Branson. 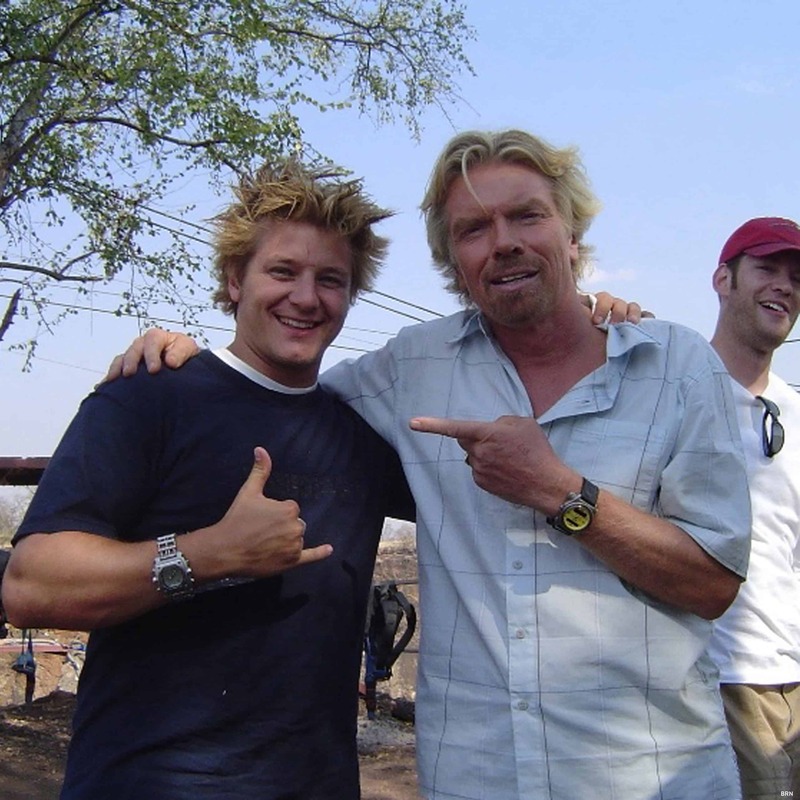 Having spent two months with him, traveling around the world filming The Rebel Billionaire, and then a few more months as President of Virgin, Worldwide, I got to know Richard pretty well. In fact, at the time, I don’t think that I realized how rare it was to spend so much time with him. I wish I would have appreciated it more. Speaking to this group of young entrepreneurs, I couldn’t help but wonder who among them might make the effort to connect with me, and try to learn whatever they might from all of (the many) mistakes I have made. In case your wondering: How does it make someone like me feel to have young or inexperienced people pump me for information, or try to connect with me? The answer is—I’m always flattered, and I would be a hypocrite if I didn’t support them. I’ll always go out of my way to take a phone call, an email, or make a personal connection with anyone who is truly ambitious. So thank you to tall of you in attendance and thank you to The Dillons at NGLV for having me out! I had a great time and I always learn just as much from these experiences as I might have to share. Deep thought on Necker Island. In the end, the reason that these two basic principles are the absolute best and most comprehensive advice I can give to entrepreneurs is because they are all-encompassing. Between the best books and the best people are all of the advice and answers you will ever need. No matter what the industry or what the situation, elements of it have all been done before and it is simply cheaper to learn from other’s mistakes instead of your own. This entry was posted in Shawny's Life on a Couch and tagged beanbag, Billionaire, blog, celebrities, celebrity, Couch, couch life, Design, designer, entrepreneur, Family, founder, Furniture, home, homes, interior design, interview, inventor, LA, life on a couch, love, Lovesac, NGLV, Rebel, Sac, Sactionals, Sectionals, Shawn D Nelson, Shawn David Nelson, shawn nelson, shawny nelson, sofa, speaking, television, travel on October 10, 2014 by Shawn Nelson.